Caregivers are known for being resourceful and excellent with time management. 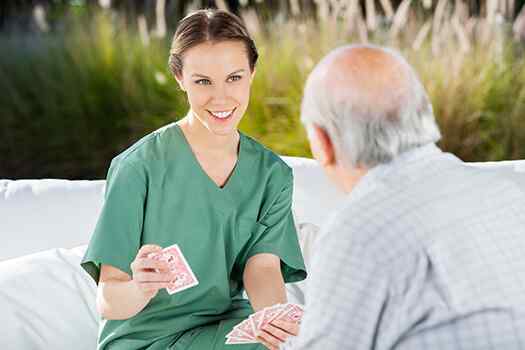 However, it always helps to discover new ways to provide better care for your senior loved one. Check out these seven life hacks that can streamline your routine while encouraging your loved one to be more independent. If your loved one enjoys the outdoors, you should always be prepared for an emergency trip to a hospital. Consider keeping an emergency care kit in your car, as well as a tote bag with essentials such as nonperishable snacks, bottled water, and a sweater. Keeping an emergency care kit in your car ensures you have what you need when you take your loved one out in public. Creating an emergency care kit is one of the many ways to ensure your loved one’s safety and increase his or her quality of life. If you have a senior loved one who needs help maintaining a high quality of life while aging in place, reach out to Green Valley Home Care Assistance, an in-home care provider families can rely on. All of our caregivers are bonded, licensed, and insured, there are no hidden fees, and we never ask our clients to sign long-term contracts. Working with a team of caregivers can help you manage other responsibilities while knowing your loved one is in safe hands. You can use smartphone apps that allow you to share journal entries with other caregivers regarding your loved one’s care. From listing the last dose of medication to giving an update on your loved one’s mood, shared journal apps have several features that offer a fast and simple way to keep everyone in the loop. The last thing you need is to worry about whether or not your loved one remembered to lock the doors. With home automation, you can set tasks to be done automatically, or you can use your smartphone to do them yourself. You can also use this strategy to manage lights, shut off appliances, and send alerts when something is not done. There is no denying the relaxing quality of candles. However, you may worry about your loved one starting a fire at home if he or she uses candles without supervision. With battery operated candles, your loved one can still enjoy the soothing flickering of a flame without having to extinguish a real one. Changes in your loved one’s vision may make it easier to miss a step when he or she goes up or down stairs. Grab some colored masking tape, and put a line down along the edge of each step. Highlighting steps makes them easier to see so your loved one is less likely to experience a fall-related injury. Bathing is one of the most challenging caregiving tasks. Prevent your loved one from getting cold by placing everything you need in a basket stored near the shower before you begin. You can also delegate this task to a professional caregiver who knows even more hacks, such as how to use a towel properly for draping. If your senior loved one needs hourly or live-in care, Green Valley Home Care Assistance can help. Our caregivers can assist with exercise and mobility, prepare nutritious meals, provide timely medication reminders, and help with a wide array of other important daily tasks. Seniors with arthritis and other conditions that limit hand movement sometimes find it difficult to perform simple tasks such as pulling up a zipper. Tie string through the loop at the end of your loved one’s zipper pulls to give him or her more surface area to grasp. You can also cut a slit into the foam on rollers and slide this onto silverware to make mealtimes easier for your loved one. Caring for a senior loved one can be an overwhelming task. Family caregivers should consider hiring professional caregivers to reduce stress and prevent burnout. Whether your elderly loved one needs part-time assistance with basic household chores or you need a break from your caregiving duties, the Green Valley respite care experts at Home Care Assistance are here to help. All of our respite care services are backed with a 100% satisfaction guarantee, there are no hidden fees in our contracts, and we never ask our clients to sign long-term contracts. Call us at 520-625-2050 to learn about our premier home care plans.